We love cute things inspired by Japanese kawaii and wanted to share our finds as well as our own creations with the world. We hope you will enjoy our posts. More Cuteness at the Taipei Airport! Our blog is promotional in nature. We highlight our designs and designs from our associated partners. We offer our quality products and gift giving options to our readers for their browsing and shopping pleasure. Should our visitors purchase any of our products we will receive royalties. And should any of our readers purchase our associates products, we could receive a percentage of that purchase value via referral fees. Below is the third part of the BBC documentary from the series Japanorama on Japanese Kawaii. Here's part two of the BBC documentary on kawaii culture in Japan from the series Japanorama. We came across this really interesting documentary by the BBC on Japan and kawaii from their Japanorama series. This is part one of three on the kawaii phenomenon! We'll bring you the remaining episodes in subsequent posts. OMG! I love these Momiji dolls. They are sooooo adorable! 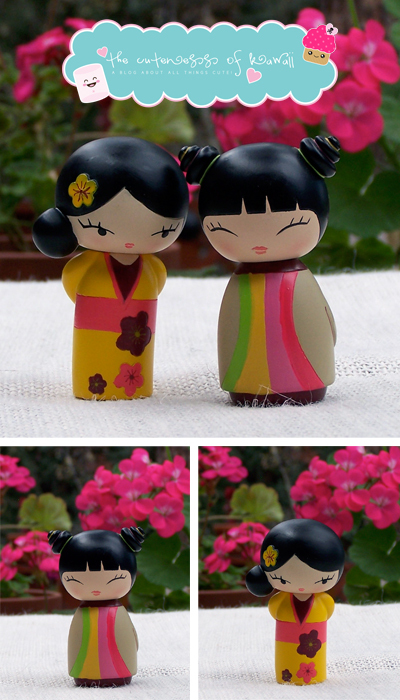 Momiji dolls are small, brightly colored hand painted message dolls. Inside each one there’s a tiny folded card for your own secret message, dream or wish. I recently purchased one to give to my long time friend, Shari, for her birthday! I have known Shari since we were in middle school back in Okinawa and she was my very best friend. Of course, I couldn't not get one for myself! I got Shari the "Birthday Girl" momiji (left top image) and I got the "Party Girl" momiji (right top image) for myself. I think of them as modern kokeshi dolls! Enjoy and have a super kawaii day! 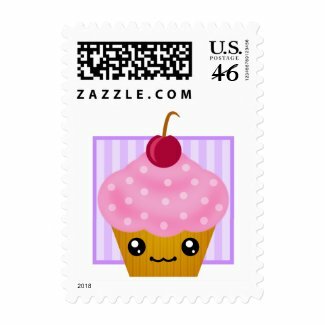 Yes, there really are kawaii postage stamps available in the USA! Check out these super fun kawaii stamps. The people of Taiwan love some Hello Kitty! Here's a video featuring a mega adorable nursery at the Taipei Airport. How utterly kawaii and truly wonderful this is. Hope you like it! Have a super kawaii day! Sanrio Hello Kitty Gate At Taoyuan International Airport! Wow! This is amazing and so very kawaii. This is an actually boarding gate area at the Taipei Airport in Taiwan. How fun! I definitely wouldn't get bored at that airport. Halloween is just around the corner and it's time to start getting ready for the trick or treating! 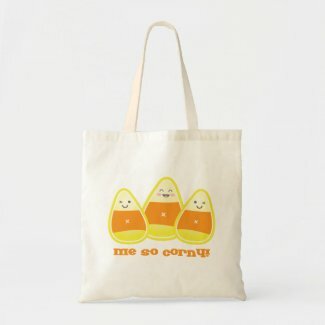 Take a look at these great environmentally friendly canvas kawaii Halloween candy bags. 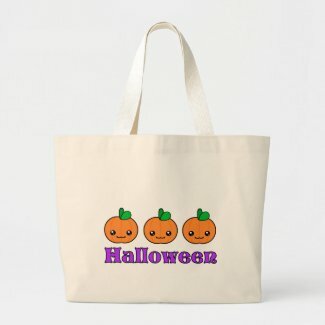 Besides being great candy bags, you can also use them to store Halloween decorations and costumes. 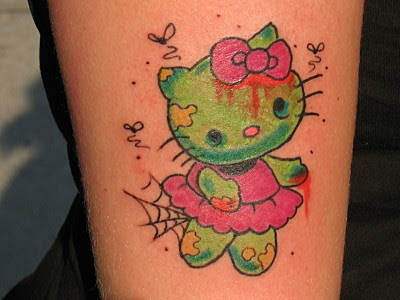 How cute is this for Halloween? 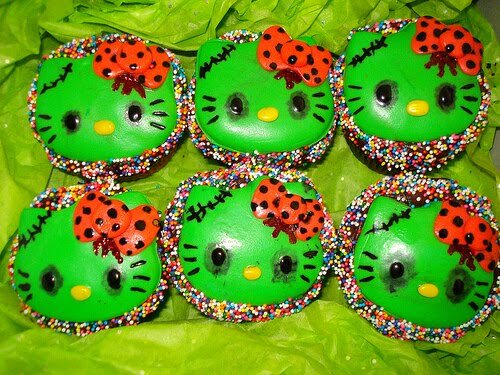 Hello Kitty Zombie Cupcakes by Little Sweeties Cupckaes on Flickr. When we came across this great picture we just had to share! So kawaii!! Apparently these cupcakes were inspired by the tattoo below. 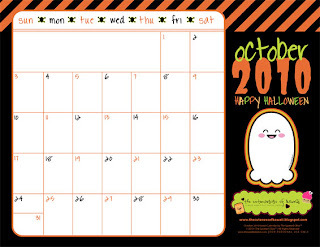 Thanks for stopping by and checking our our FREE kawaii printable October 2010 calendar by The Spotted Olive™! The image above is a small version of the actual calendar. Download the 11" x 8.5" printable version of this calendar by clicking the following link: Free Kawaii October 2010 Printable Calendar! Print on LANDSCAPE setting and FIT TO PAGE on 8.5 x 11 paper. All printable freebies are copyright by Mega Kawaii™ or The Spotted Olive™ and are intended for non-profit personal use only. Our printable freebies are not to be used for any profitable or commercial purposes whatsoever. 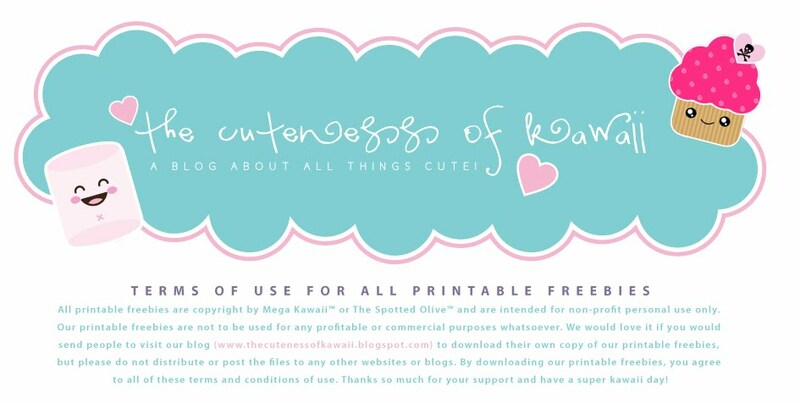 We would love it if you would send people to visit our blog (http://www.thecutenessofkawaii.blogspot.com) to download their own copy of our printable freebies, but please do not distribute or post the files to any other websites or blogs. By downloading our printable freebies, you agree to all of these terms and conditions of use. Thanks so much for your support and have a super kawaii day! Halloween is just around the corner and we came across this great tutorial on how to do Geisha makeup with a modern twist! This look is so kawaii and would be great for a Halloween party!